Forum attendees came to learn more about building the struggle for full immigrant rights in the face of the Trump administration’s attacks, and to discuss the recent victories across the country against fascist and far right rallies. The first presentation highlighted the connection between U.S. imperialism and the refugee crisis in Central America, as poor and working-class people flee violence, instability and poverty shaped by decades of CIA interventions and U.S.-promoted economic policies. In June, hundreds of thousands of people took to the streets across the country to demand an end to deportations, and the separation of families at the border. The mass demonstrations rejected the scapegoating tactics aimed at immigrants and showed the potential and desire for a sustained movement to stand against anti-immigrant racism. The potential of such a movement has been consistently derailed and hampered by the misleadership of the Democratic Party, which has adopted right-wing talking points about “good immigrants” vs. “bad immigrants,” refuses to back full equality, and subordinates all movement tactics to their own electoral ambitions. The second presentation reported on the mobilizations of tens of thousands of people against racism and fascism across the country on the one-year anniversary of the “Unite the Right” protest in Charlottesville. This year’s rightwing demonstrations to “Unite the Right” as well as the ludicrously named “March Against Far-Left Violence” rallies were vastly outnumbered by anti-fascists. In D.C. 15,000 people stood united to confront the fascists at their rallying point in front of the White House, and the fascist rally dispersed quickly under police protection. In Austin too hundreds gathered against an equally small number. The anti-fascist mobilizations nationwide exposed the inadequacy of the liberal strategy to either ignore or out-debate the far-right out of existence; mass direct action is the only way. 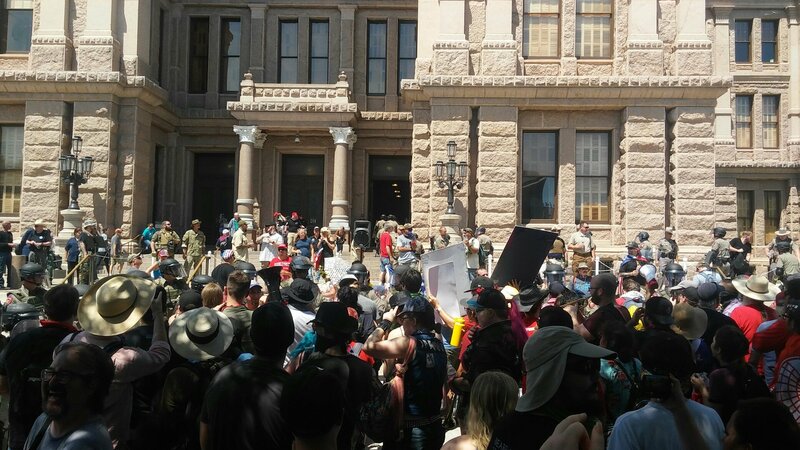 The forum also shared lessons from protests at the Texas State Capitol for immigrant rights and against far-right forces like Patriot Front, a racist, anti-Semitic hate group. Participants also expressed anger at how the corporate media treats the fascist forces so lightly, and publicizes their racist messages. While this gives the impression that the far-right is rapidly growing, the numbers and strength of the anti-racist forces is always understated or overlooked. During the anti-fascist forum, a group of masked individuals who purport to be communists disrupted the event with the goal to “drive the PSL out of Austin.” The forum proceeded nonetheless and was another step forward in the PSL’s initial organizing in the city. The same night as the forum, a Muslim Community Center in North Austin was attacked, its windows smashed in, showing the urgent need for a strong movement to confront far-right bigotry. We have a perspective towards building broad unity in defense of the working class and oppressed, and invite others to join us.